Millwall Football Club (/ˈmɪlwɔːl/) is a professional football club in Bermondsey, South East London, England. The team competes in The Championship, the second tier of English football. Founded as Millwall Rovers in 1885, the club has retained its name despite having last played in the Millwall area of the Isle of Dogs in 1910. From then until 1993 the club played at what is now called The Old Den in New Cross, before moving to its current home stadium nearby, called The Den. The traditional club crest is a lion rampant, referred to in the team's nickname 'The Lions'. Millwall's traditional kit consists of blue shirts, white shorts and blue socks. In Millwall's 91 seasons in the Football League from 1920–21 to 2017–18, the club have been promoted eleven times (five times as champions) and relegated nine times. They have spent the majority of their existence yo-yoing between the second and third tier of the Football League. The team spent two seasons in the top flight between 1988 and 1990, in which the club achieved its highest ever finish of tenth place in the First Division. In 2004, the team reached the FA Cup final and qualified for the UEFA Cup, playing in Europe for the first time in their history. The club has reached the FA Cup semi-finals in 1900, 1903, 1937, 2013 and the League Cup quarter-finals in 1974, 1977 and 1995. Millwall have also won two League One playoff finals in 2010 and 2017, the Football League Group Cup in 1983, and finished runners-up in the Football League Trophy in 1999. In the media, Millwall's supporters have often been associated with hooliganism, with numerous films having been made fictionalising their notoriety. The fans are renowned for their chant "No one likes us, we don't care". Millwall have a long-standing rivalry with West Ham United. The local derby between the two sides has been contested almost a hundred times since 1899. The club also share a rivalry with Leeds United, and contest the South London derby with local rivals Crystal Palace and Charlton Athletic. Further information: History of Millwall F.C. 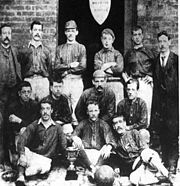 Millwall Rovers were formed by the workers of J. T. Morton's canning and preserve factory in the Millwall area of the Isle of Dogs in London's East End in 1885. Founded in Aberdeen in 1849 to supply sailing ships with food, the company opened their first English cannery and food processing plant at Millwall dock in 1872 and attracted a workforce from across the country, including the east coast of Scotland, primarily Dundee. The club secretary was 17-year-old Jasper Sexton, the son of the landlord of The Islander pub in Tooke Street where Millwall held their club meetings. Millwall Rovers' first fixture was held on a piece of waste ground on Glengall Road, on 3 October 1885 against Fillebrook, a team that played in Leytonstone. The newly formed team were beaten 5–0. Rovers found a better playing surface for the 1886–87 season, at the rear of the Lord Nelson pub and it became known as the Lord Nelson Ground. In November 1886, the East End Football Association was formed, along with the Senior Cup Competition. Millwall made it to the final against London Caledonians, which was played at Leyton Cricket Ground. The match finished 2–2 and the teams shared the cup for six months each. Millwall won the East London Senior Cup at the first attempt. The club also won the cup in the following two years, and the trophy became their property. In April 1889, a resolution was passed for Millwall to drop "Rovers" from their name, and they began playing under the name Millwall Athletic, inspired by their move to their new home The Athletic Grounds. They were founding members of the Southern Football League which they won for the first two years of its existence, and were runners-up in its third. They were forced to move to a new ground North Greenwich in 1901, as the Millwall Dock Company wanted to use their land as a timberyard. Millwall Athletic reached the semi-finals of the FA Cup in 1900 and 1903, and were also champions of the Western Football League in 1908 and 1909. Annual table positions of Millwall in the Football League, 1920–2016. Millwall, who had now also dropped "Athletic" from their name, were invited to join the Football League in 1920 for the 1920–21 season, along with 22 other clubs, through the creation of the new Football League Third Division. The Southern League was shorn of its status, with almost all its clubs deciding to leave—Millwall followed suit. Millwall's first Football League match was on 28 August 1920 at The Den, and they were 2–0 winners against Bristol Rovers. In the 1925–26 season Millwall had 11 consecutive clean sheets, a Football League record, which they hold jointly with York City and Reading. Millwall became known as a hard-fighting Cup team and competed in various memorable matches, notably defeating three-time league winners and reigning champions Huddersfield Town 3–1 in the third round of the 1926–27 FA Cup. In the 1927–28 season Millwall won the Third Division South title and scored 87 goals at home in the league, an English record which still stands. Matches against Sunderland and Derby County saw packed crowds of 48,000-plus in the 1930s and 1940s. Their 1937 FA Cup run saw Millwall reach the semi-finals for the third time, and a fifth-round game against Derby still stands as Millwall's record attendance of 48,762. Millwall were the 11th best supported team in England in 1939, despite being in the Second Division. Millwall were one of the most financially wealthy clubs in England. The club proposed plans to improve the Den and signed international players. Winger Reg 'JR' Smith was capped twice, scoring two goals for England in 1938. The Lions were pushing for promotion to the First Division toward the end of the decade, but one week into the 1939–40 season, World War II broke out and Millwall were robbed of their aim. The loss of so many young men during the Second World War made it difficult for clubs to retain their former status. This was especially true for Millwall, who appeared to suffer more than most. From being one of the country's biggest clubs before the war, Millwall were reduced to one of its smallest afterward. The Den sustained severe bomb damage on 19 April 1943, and one week later a fire, determined to have been caused by a discarded cigarette, also destroyed an entire stand. The club accepted offers from neighbours Charlton Athletic, Crystal Palace and West Ham United to stage games at their grounds. On 24 February 1944, Millwall returned to The Den, to play in an all-standing stadium. This was achieved with considerable volunteer labour by Lions fans. Millwall's fortunes fluctuated in the immediate post war years, they were relegated to Division Three South in 1948 and had to apply for re-election to the league in 1950 after finishing in the bottom two. An upswing in fortunes saw Millwall finish 5th, 4th, and then runners up in Division Three South in 1952–53 season; but with only the Champions being promoted, Millwall found themselves stuck in the third tier despite averaging crowds of over 20,000. Millwall then suffered a down swing in fortunes with a number of bottom-half finishes. One highlight of the period was one of the biggest giantkilling upsets in the Fourth Round of the 1956–57 FA Cup on 26 January 1957, when Millwall beat Newcastle United 2–1 in front of a crowd of 45,646. Millwall suffered the ill fortune of becoming a founding member of Division Four in 1958. While initially suffering from this reorganisation, the de-regionalisation of Third Division North and Third Division South opened up the way for promotion via the runner up spots. Millwall won the Division Four Title in 1962 with the help of 23 Goals from Peter Burridge and 22 from Dave Jones. They were relegated again in the 1963–64 season, but were to bounce back by winning back-to-back promotions as runner up. This is the last time Millwall played in the fourth tier. Millwall came out of administration, and new chairman Theo Paphitis appointed ex-West Ham United manager Billy Bonds as manager. The 1997–98 season was not a successful one, with the club hovering close to relegation to the fourth tier. Bonds was sacked and replaced by Keith "Rhino" Stevens, with Alan McLeary as his assistant. McLeary was later promoted to the role of joint-manager alongside Stevens. Stevens and McLeary led Millwall to their first ever official appearance at Wembley Stadium. The Lions reached the 1999 Football League Trophy Final with a golden goal win against Gillingham in the semi-finals, and a 2–1 aggregate victory over Walsall in the regional final. They faced Wigan Athletic in the final but, while playing in front of 49,000 of their own fans, lost 1–0 to an injury-time goal. Millwall also lost 1–0 on aggregate to Wigan in the Second Division play-off semi-finals the 1999–2000 season. In 2005, Theo Paphitis announced that he was stepping down as chairman of the club with Jeff Burnige to replace him from May 2005. At the end of the 2004–05 season, manager Dennis Wise announced that he was leaving as he was unable to form a working relationship with the new chairman. Former Millwall striker Steve Claridge was announced as the new player-manager of Millwall. However, when Burnige then stepped down just two months after taking up the post, it was announced on 27 July that Claridge had been sacked after just 36 days, without ever taking charge of the team in a competitive match. Former Wolverhampton Wanderers manager Colin Lee replaced him but lasted only five months in charge of the club. 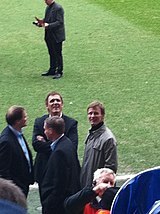 On 21 December, with the club bottom of the Championship, he became the club's Director of Football and was replaced as manager by 32-year-old player Dave Tuttle, on a short-term contract until the end of the 2005–06 season. Tuttle had no prior experience in football management. In February 2006, Lee left the club altogether. Millwall experienced a difficult season, having had four managers in 2005. Their 13 goals scored at home was the second worst in Football League history. Their relegation to League One was confirmed on 17 April 2006 with a 2–0 loss against Southampton. In the closed season Nigel Spackman was appointed as the new manager, but he lasted only four months after a string of bad results. In September 2006, Theo Paphitis (chairman from 1997 to 2005) ended his nine-year association with the club after a year-long spell as a non-executive director. On 19 March 2007, Willie Donachie signed a two-year contract following some progress which had seen the club climb to 11th place in the league. Before Donachie took charge, Millwall had taken only six points from their first ten games. In the 2007–08 season Millwall sat bottom of the table at the beginning of October. Donachie was sacked on 8 October, with Richard Shaw and Colin West becoming caretaker managers. In March 2007, Chestnut Hill Ventures, led by American John Berylson, which have interests in business and financial services, retail, property and sport, invested £5 million into the club. The continued investment of Berylson, who has since become the club's major shareholder and chairman, has steered The Lions on a better course on and off the pitch. The appointment of Kenny Jackett as manager on 6 November 2007, proving crucial. Over the course of the next two seasons Jackett led Millwall to two top six finishes in League One, in fifth and third place respectively. He won the League One Manager of the Month award three times while in charge of the club. Several of his key signings helped propel Millwall toward the play-offs, and eventual promotion. 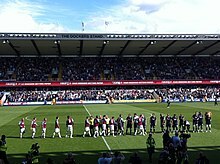 After a play-off final defeat in the 2008–09 season against Scunthorpe United and losing out on automatic promotion on the last day of the 2009–10 season to Leeds United by one point, Millwall made it back to Wembley, finally breaking the play-off hoodoo run of five successive failures in 1991, 1994, 2000, 2002 and 2009, with a 1–0 win in the 2010 League One play-off final against Swindon Town, securing a return to the Football League Championship after a four-year absence. Millwall's first game back in the Championship was a 3–0 away win at Bristol City. The game had been much hyped due to City's signing of then-England goalkeeper David James. Only days after the defeat, Steve Coppell resigned as City manager. The Lions celebrated the 125th anniversary of the club on 2 October 2010, which was the closest home game date to the first fixture Millwall ever played against Fillebrook on 3 October 1885. Millwall drew 1–1 with Burnley and wore a special one-off kit for the game, made by manufacturers Macron, which bore the names of every footballer who had played for the club. Kenny Jackett celebrated five years in charge of the club in November 2012, with a 4–1 victory away at Nottingham Forest. After a strong start to the 2012–13 season, including a 13-game unbeaten run and flirting with the play-offs, Millwall finished poorly, with only five wins in the last 23 games, narrowly avoiding relegation on the last day of the season. Their poor league form coincided with reaching the semi-final of the FA Cup for the fifth time in their history. They played Wigan Athletic at Wembley Stadium on 14 April 2013, losing 2–0 to the eventual cup winners. Kenny Jackett resigned on 7 May 2013. He was Millwall's fourth-longest serving manager. After a month of searching, Millwall appointed St Johnstone boss Steve Lomas as their new manager on 6 June 2013. His appointment provoked mixed emotions among some supporters, due to him being a former captain of West Ham United, their biggest rival. Club record goalscorer Neil Harris returned to Millwall as a coach on 23 June 2013 after retiring as a player through injury. Millwall sacked Lomas on 26 December 2013, after winning only five of his first 22 games in charge. Harris and youth team coach Scott Fitzgerald took over as joint caretaker-managers. On 4 January 2014 Millwall lost 4–1 at Southend United in the FA Cup, a team 31 places below them in the football pyramid. Harris described the performance as a "shambles." The club appointed Ian Holloway as their new manager on 6 January 2014, with the club sitting 21st in the table. He was given the priority of maintaining their Football League Championship status, which he achieved. Millwall went unbeaten in the last eight games of the 2013–14 season and finished in 19th place, four points above the relegation zone. The following season, Holloway was sacked on 10 March 2015 with the team second from bottom in the Championship, and Neil Harris was reinstated as caretaker manager until the end of the season. He was unable to ensure survival, however, as Millwall's relegation to League One was confirmed on 28 April with one game of the 2014–15 season still to play. Harris was confirmed as Millwall's permanent manager the next day. In his first full season in charge, Harris led Millwall to a fourth-place finish in League One and a play-off final at Wembley, which the Lions lost 3–1 to Barnsley. 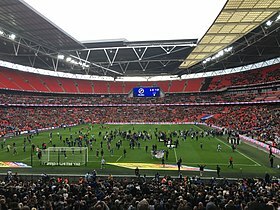 In the 2016–17 FA Cup, Millwall reached the Quarter-finals for the ninth time in their history, knocking out Premier League opposition in three consecutive rounds: Bournemouth in the third round, Watford in the fourth round, and reigning Premier League champions Leicester City in the fifth round. On 28 February 2017, Millwall beat Peterborough United 1–0 and increased their unbeaten run to 16 games in all competitions, and have gone nine games without conceding a goal for the first time since the 1925–26 season. Millwall made it to the League One play-off final at Wembley for the second successive year, after beating Scunthorpe United 3–2 in the semi-final. They were promoted back to the Championship following a 1–0 playoff final victory over Bradford City, thanks to an 85th-minute winner from Steve Morison, his 86th goal for the club. In Millwall's return to the Championship in the 2017–18 season the team went on a club record 17-game unbeaten run; their longest streak in the second tier, which surpassed a record of 15 set in 1971. During the undefeated run they won six away wins in a row, equalling a club record set in the 2008–09 season. The club crest has been a rampant lion since 1936, which was also introduced by Charlie Hewitt. There have been many variations of the lion; the first was a single red lion, often mistakenly said to be chosen because of the club's Scottish roots. The lion bore a striking resemblance to signs used by pubs named The Red Lion. From 1956 to 1974 Millwall's crest was two leaping red lions facing each other. Former chairman Theo Paphitis brought back the badge in 1999, where it was used for a further eight years. The current crest is a leaping lion, which first appeared on a Millwall kit in 1979. It remained until 1999 and was re-introduced again in 2007. The club mascot is a giant lion called Zampa, named after Zampa Road, the road The Den is located on. In September 2016 Lewisham Council approved a compulsory purchase order (CPO) of land surrounding The Den rented by Millwall, as part of a major redevelopment of the "New Bermondsey" area. The plans were controversial because the developer, Renewal, is controlled by offshore companies with unclear ownership, and is seen by the club and local community to be profiteering by demolishing existing homes and businesses as well as Millwall's car-park and the Millwall Community Trust facility to build up to 2,400 new private homes, with no social housing. The club contemplated the possibility of having to relocate to Kent. Millwall had submitted their own plans for regeneration centred around the club itself, but the council voted in favour of Renewal's plans. In December 2016 Private Eye reported how Renewal had been founded by a former Lewisham Council leader and senior officer, suggesting potential bias, and that the decision to approve Renewal's plans may have been made as far back as 2013 despite the fact that no due diligence had been able to be carried out by PricewaterhouseCoopers due to "poor" and "limited" access to information and management at Renewal, which is controlled from the Isle of Man and British Virgin Islands. In the face of mounting community opposition and media scrutiny, the Council said in January 2017 it will not proceed with the CPO. However, it was later reported to be taking legal advice regarding other avenues of securing the CPO, and Council cabinet members will decide how to proceed after a "review". Private Eye reported that Millwall are continuing to explore relocation options in Kent. A tradition at The Den is the playing of the official club song "Let 'em Come", by Roy Green, as Millwall and the opposing team walk onto the pitch. It was specifically written for the club and the lyrics represent old London culture, such as eating jellied eels and having a glass of beer before going to the game. The song ends with all home fans standing, arms raised (usually in the direction of the travelling fans singing the last line, "Let 'em all... come down.... to The Den!" A television drama about a Millwall supporter and ex-docker, starring David Jason, featured a lyric from the song in its title, Come Rain Come Shine. The song was played on repeat at Wembley Stadium after Millwall gained promotion to the Championship in 2010. The song "Shoeshine Boy" by the Mills Blue Rhythm Band was played as the entrance song before "Let 'em Come". Millwall were listed eighth out of a list of 92 Football League clubs with the most rivals, with West Ham United, Leeds United, Crystal Palace, Charlton Athletic, Portsmouth and Gillingham considering them a major rival. Millwall's fiercest rival is West Ham United. It is one of the most passionately contested local derbies in football. The two clubs have rarely met in recent years due to them playing in different leagues; the majority of their meetings happened before the First World War, with some 60 meetings between 1899 and 1915. The clubs have played 99 times since the first contest in 1899. Millwall have won 38, drawn 27 and lost 34. Despite violence between the two sets of supporters and calls for future games between the clubs to be played behind closed doors, they last met in the Football League Championship in 2011–12 with no outright ban on either set of fans, and no repeat of crowd trouble. The rivalry between the sides, specifically the clubs' two hooligan firms has been depicted on the big screen several times, in films such as Green Street. Millwall share a fierce rivalry with Leeds United. The rivalry between the teams is intensified by both clubs passionate fans and association with football hooliganism. The clubs' two hooligan firms; the Leeds United Service Crew and the Millwall Bushwackers were notorious in the 1970s and 80s for their violence, being called "dirty Leeds" and "the scourge of football" respectively. From 1920 to 2003 the sides met just 12 times; competing in different tiers for the majority of their histories, and neither considering the other a rival on the pitch. Since Leeds were relegated from the Premier League in 2004, the teams have met 25 times in 14 years. The rivalry began in League One during the 2007–08 season, with disorder and violent clashes between both sets of fans and the police at Elland Road. It continued into the 2008–09 season; where the teams were vying for promotion to the Championship, culminating in Millwall knocking Leeds out of the League One playoffs at the semi-final stage. The clubs have played each other 37 times and are evenly matched; Millwall has won 17, Leeds 15 and five games have ended in a draw. Millwall are closest in proximity to Charlton Athletic, with The Den and The Valley being less than four miles (6.4 km) apart. They last met in 2017, a 0–0 draw at the Valley. Since their first competitive game in 1921, Millwall have won 35, drawn 26 and lost 12. The Lions are unbeaten in their last ten games against Charlton, stretching over 21 years, where they have won five and drawn five. The Addicks last win came in March 1996 at The Valley. The Lions last played against fellow South London club Crystal Palace in the 2012–13 season when both teams were in the Football League Championship. They drew 0–0 at The Den and 2–2 at Selhurst Park. In almost 100 competitive games between the two clubs since 1906, Millwall have won 39, drawn 29 and lost 29. As of the 2017–18 season, all three teams play in different leagues. Crystal Palace play in the Premier League, Millwall in The Championship and Charlton in League One. As of 30 March 2019. There have been 33 permanent and 14 caretaker managers since the appointment of the club's first professional manager, Bert Lipsham on 4 May 1911. From 1890 to 1910, Millwall directors Kidd, Stopher and Saunders were honorary managers, also working under the title of club secretary. Bob Hunter is Millwall's longest serving manager, having stayed at the helm for 15 years. Prior to becoming manager, he was the club's trainer for 21 years. He died in office in 1933, having served at the club for a total of 36 years. Steve Claridge holds the shortest tenure at the club, having been in charge for a period of 36 days without ever taking charge of a first-team game. Every Millwall manager has come from the United Kingdom or Ireland. Current manager Neil Harris is the eighth longest serving manager in English football and the longest serving in the Championship. As of 11 June 2018. Second Division (tier 2) Champions 1988 Promoted to the top flight for the first time in the club's history. Third Division South / Second Division (tier 3) Champions 1928, 1938, 2001 Millwall set an English record in 1928 with 87 league goals scored at home. Finished with 93 points in 2001, a club record. Third Division (tier 3) Promoted 1966, 1976, 1985 Unbeaten at home for the second successive season in 1965–66. Automatically promoted after finishing third in 1976. Football League One (tier 3) Play-off winners 2010, 2017 Won 1–0 against Swindon Town in 2010 and 1–0 against Bradford City in 2017. Fourth Division (tier 4) Runners-up 1965 Finished one point behind the champions. Barry Kitchener holds the record for Millwall appearances, having played 596 matches between 1966 and 1982. The goalscoring record is held by current manager Neil Harris, with 138 in all competitions. He broke the previous record of 111 goals, held by Teddy Sheringham on 13 January 2009, during a 3–2 away win at Crewe Alexandra. The club's widest victory margin in the league is 9–1, a scoreline which they achieved twice in their Football League Third Division South championship-winning year of 1927. They beat both Torquay United and Coventry City by this score at The Den. Millwall's heaviest league defeat was 8–1 away to Plymouth Argyle in 1932. The club's heaviest loss in all competitions was a 9–1 defeat at Aston Villa in an FA Cup fourth-round second-leg in 1946. Millwall's largest Cup win was 7–0 over Gateshead in 1936. Their highest scoring aggregate game was a 12-goal thriller at home to Preston North End in 1930 when Millwall lost 7–5. As of 9 March 2019. 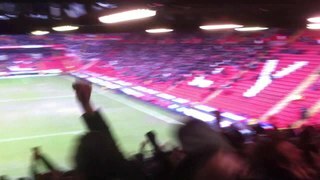 The infamous terrace chant of Millwall supporters – No one likes us, we don't care. The stigma of violence attached to Millwall can be traced back over 100 years. Millwall played local rivals West Ham United away at Upton Park on 17 September 1906 in a Western League game. Both sets of supporters were primarily made up of dockers, who lived and worked in the same locality in east London. Many were rivals working for opposing firms and vying for the same business. A local newspaper, East Ham Echo, reported that, "From the very first kick of the ball it was seen likely to be some trouble, but the storm burst when Dean and Jarvis came into collision (Millwall had two players sent off during the match). This aroused considerable excitement among the spectators. The crowds on the bank having caught the fever, free fights were plentiful." In the 1920s Millwall's ground was closed for two weeks after a Newport County goalkeeper, who had been struck by missiles, jumped into the crowd to confront some of the home supporters and was knocked unconscious. The ground was again closed for two weeks in 1934 following crowd disturbances after the visit of Bradford Park Avenue. Pitch invasions resulted in another closure in 1947 and in 1950 the club was fined after a referee and linesman were ambushed outside the ground. The 1985 Kenilworth Road riot, after an FA Cup sixth-round match between Luton Town and Millwall on 13 March 1985, became one of the worst and widely reported incidents of football hooliganism to date. On that night, approximately 20,000 people packed into a ground that usually only held half that number to watch Luton beat Millwall 1–0. Numerous pitch invasions, fighting in the stands and missile-throwing occurred, of which one such object hit Luton's goalkeeper Les Sealey. It led to a ban on away supporters by Luton from their Kenilworth Road ground for four years. Luton were asked by Millwall to make the Wednesday night match all-ticket, but this was ignored. As a result, rival hooligan firms gained access to the stadium. As well as the Millwall hooligans and those belonging to Luton's firm the MIGs, many of the 31 fans arrested after the violence were identified as being from Chelsea's Headhunters firm and West Ham United's Inter City Firm. The FA commissioned an inquiry which concluded that it was "not satisfied that Millwall F.C. took all reasonable precautions in accordance with the requirements of FA Rule 31(A)(II)." A£7,500 fine was levied against Millwall, though this was later withdrawn on appeal. The penalty that Millwall faced was perhaps that the club's name was now "synonymous with everything that was bad in football and society". On 29 May 2016, Millwall played in the Football League One play-off final against Barnsley at Wembley Stadium, but towards the end of the match, with Barnsley winning 3–1, a group of Millwall supporters broke through a security barrier and attacked Barnsley supporters, some of whom were forced to leave the stadium to avoid the violence. Also there were objects thrown towards the Barnsley players and Barnsley supporters during the game. The fighting and violence was condemned by the Football Association. On 26 January 2019, Millwall beat Everton 3–2 and knocked them out of the FA Cup. The two teams supporters clashed away from The Den before the game, with an Everton fan being slashed across the face with a knife. A senior Metropolitan Police officer said, it was "some of the most shocking football violence seen for some time". The game was also blighted by allegations of racist chanting. In 1985, the club founded the Millwall Community Trust (MCT), which offers sporting, educational and charitable projects. The Trust is based next door to The Den, in the Lions Centre. Working with local people from the surrounding boroughs of Lewisham, Southwark and the wider Millwall Community. The Trust offers sports and fitness programmes, educational workshops, disability activities and soccer schools. The club helps promote anti-knife and anti-gun crime. In a match against Charlton Athletic in 2009, both teams wore special kits for the match in honour of murdered local teenagers and supporters Jimmy Mizen and Rob Knox. The logos of both clubs' shirt sponsors were replaced by the text, "Street violence ruins lives". The club has also helped raise over £10,000 for the charity Help for Heroes. ^ "Millwall pronunciation in English". Forvo. Retrieved 9 May 2016. ^ a b c d e f g h i j k l m "Millwall – Historical Football Kits". Historical Football Kits. Retrieved 28 August 2010. ^ a b c d e f g Lindsay (1991), p. 8. ^ a b c d e f g h i j k "Millwall History". Millwall Football Club. Archived from the original on 1 October 2012. Retrieved 5 September 2010. ^ a b c d Lindsay (1991), p. 9. ^ Lindsay & Tarrant (2010), p. 11. ^ Lindsay (1991), p. 12. ^ a b c d e f g Lindsay (1991), pp. 32–33. ^ Lindsay (1991), pp. 170–172. ^ Lindsay (1991), pp. 16–17. ^ a b Lindsay (1991), p. 176. ^ a b Lindsay (1991), p. 17. ^ Lindsay (1991), p. 18. ^ a b c d "Football League Records – Goals". The Football League. 3 August 2008. Archived from the original on 20 March 2012. Retrieved 28 August 2008. ^ a b Randall, David (17 January 1999). "Fa Cup Shock: romance is dying". The Independent. Retrieved 30 September 2010. ^ a b c "The Den Millwall FC – Football Ground Guide". Football Ground Guide. Archived from the original on 24 July 2011. Retrieved 8 September 2010. ^ "Millwall Attendances". England Historical Attendances. Archived from the original on 8 August 2015. Retrieved 22 April 2015. ^ a b "Millwall, The Den and the misfortunes of war". The Millwall History Files. Retrieved 30 September 2010. ^ "Millwall Internationals". The Millwall History Files. Retrieved 13 July 2013. ^ a b c d e Lindsay (1991), p. 317. ^ "Chelsea v Millwall, Wembley". Millwall Prints. 30 September 2010. Archived from the original on 28 February 2011. Retrieved 30 September 2010. ^ "Millwall Football Club Diary". Gone Digging. 30 September 2010. Retrieved 30 September 2010. ^ Lindsay & Tarrant (2010), p. 378–379. ^ Lindsay & Tarrant (2010), p. 386–387. ^ a b c d "Millwall's unbeaten Home Record". The Millwall History Files. 17 September 2010. Retrieved 17 September 2010. ^ "Hall of Fame – Eamon Dunphy". Millwall Football Club. 6 November 2008. Archived from the original on 27 September 2008. Retrieved 10 September 2011. ^ a b Lindsay (1991), p. 394. ^ "71–72 season". The Millwall History Files. 30 September 2010. Retrieved 30 September 2010. ^ Lindsay (1991), p. 27. ^ "20 January 1974: The first Sunday football". The Guardian. 30 September 2010. Retrieved 30 September 2010. ^ a b "England League Cup Full Results 1960–1996". Retrieved 21 July 2013. ^ "82/83 season". The Millwall History Files. 30 September 2010. Retrieved 30 September 2010. ^ "84/85 season". The Millwall History Files. 30 September 2010. Retrieved 30 September 2010. ^ a b c d "Millwall vs the Mob". The Millwall History Files. Retrieved 16 September 2010. ^ "Top Goal Scorers". Millwall History. Retrieved 28 August 2010. ^ a b "1987/88 Season". The Millwall History Files. Retrieved 28 August 2010. ^ Lindsay (1991), p. 29. ^ Lindsay (1991), pp. 308–312. ^ Lindsay (1991), p. 310. ^ Lindsay (1991), pp. 48–49. ^ "Results 90–91". The Millwall History Files. Archived from the original on 28 September 2007. Retrieved 27 August 2007. ^ "Teddy Sheringham". Soccerbase. Retrieved 27 August 2007. ^ a b "Mick McCarthy". The Millwall History Files. Retrieved 28 August 2010. ^ "Views of The Den". Millwall Football Club. Archived from the original on 1 October 2012. Retrieved 27 July 2010. ^ "Moving On: The New Den". The Millwall History Files. 1 September 1993. Retrieved 1 September 2011. ^ Haylett, Trevor (19 January 1995). "Arsenal 0 Millwall 2". The Independent. Retrieved 28 August 2010. ^ "Billy Bonds". The Daily Mirror. Archived from the original on 28 August 2010. Retrieved 28 August 2010. ^ a b "Millwall 00/01 Season". The Millwall History Files. 13 January 2009. Retrieved 30 September 2010. ^ "Mark McGhee". BBC Sport. 15 October 2003. Retrieved 28 August 2010. ^ a b "Dennis Wise". BBC Sport. 3 September 2010. Retrieved 3 September 2010. ^ "Man Utd win FA CUP". BBC Sport. 22 May 2004. Retrieved 28 August 2010. ^ a b Lindsay & Tarrant (2010), p. 92–93. ^ John, Emma (7 February 2010). "Theo Paphitis sporting life". The Guardian. Retrieved 28 August 2010. ^ a b c "Lee replaces Claridge at Millwall". BBC Sport. 12 August 2010. Retrieved 28 August 2010. ^ "Tuttle replaces Lee as Lions boss". BBC Sport. 12 August 2010. Retrieved 28 August 2010. ^ "Millwall and Spackman part company". BBC Sport. 12 August 2010. Retrieved 28 August 2010. ^ "Paphitis to quit Millwall". This Is London. 12 August 2010. Archived from the original on 5 May 2013. Retrieved 28 August 2010. ^ a b "Donachie Axed". BBC Sport. 12 August 2010. Retrieved 28 August 2010. ^ a b "Lions break hoodoo". Sky Sports. 3 September 2010. Retrieved 3 September 2010. ^ a b Winter, Henry (21 May 2009). "John G Berylson proud to lead the revival of Millwall". The Telegraph. Retrieved 28 August 2010. ^ "Millwall confirm Jackett as boss". BBC Sport. 6 November 2007. Retrieved 28 August 2010. ^ "League Managers Association: Kenny Jackett profile". League Managers Association. Archived from the original on 27 January 2013. Retrieved 9 October 2011. ^ "Coppell resigns". BBC Sport. 12 August 2010. Retrieved 28 August 2010. ^ "125 Years Celebration Shirt". Millwall Online Club Shop. Millwall Football & Athletic Company (1985) PLC. Archived from the original on 31 July 2013. Retrieved 20 February 2014. ^ "Nottm Forest 1 Millwall 4: Lions cut Forest down to size with thumping win". Daily Mail. 3 November 2012. Retrieved 3 November 2012. ^ "Ipswich 3–0 Millwall". BBC Sport. Retrieved 2012-08-12. ^ "Derby 1–0 Millwall". BBC Sport. Retrieved 2013-04-05. ^ Jamie Jackson at Ewood Park (13 March 2013). "Blackburn Rovers 0–1 Millwall | FA Cup sixth-round replay match report | Football". The Guardian. Retrieved 2013-03-26. ^ a b Phil Mcnulty. "Millwall 0–2 Wigan". BBC Sport. Retrieved 2013-04-14. ^ "Kenny Jackett: Millwall manager resigns". BBC Sport. 7 May 2013. Retrieved 7 May 2013. ^ "Millwall Managers". Millwall History. 3 November 2012. Retrieved 3 November 2012. ^ "Lions confirm new boss". Millwall FC. 6 June 2013. Retrieved 6 June 2013. ^ "Poll: What do you make of Steve Lomas' arrival at Millwall?". News at Den. 6 June 2013. Retrieved 6 June 2013. ^ "Legend Returns". Millwall FC. 23 June 2013. Retrieved 23 June 2013. ^ a b "Millwall: Steve Lomas sacked after Watford defeat on Boxing Day". BBC Sport. 2013-12-26. Retrieved 2013-12-27. ^ "Harris: Millwall players let themselves down at Southend". News at Den. 2014-01-04. Retrieved 2014-01-06. ^ Fifield, Dominic (6 January 2014). "Ian Holloway appointed Millwall manager on two-and-a-half-year deal". The Guardian. Retrieved 7 January 2014. ^ "Millwall 1–0 Bournemouth". BBC Sport. 2014-05-03. Retrieved 2014-05-03. ^ "Ian Holloway sacked as Millwall manager after 14 months". BBC. Retrieved 13 April 2015. ^ "Rotherham 2–1 Reading". BBC Sport. 2015-04-28. Retrieved 2015-04-28. ^ "Neil Harris named manager of relegated club". BBC Sport. 2015-04-29. Retrieved 2015-04-29. ^ "Barnsley 3–1 Millwall". BBC Sport. 2016-05-29. Retrieved 2016-05-29. ^ "Leicester gloom deepens as Ranieri's men suffer Cup shock". Reuters. ^ "Millwall boss: Gregory answered the questions with penalty winner". NewsatDen. Retrieved 2017-03-01. ^ "Scunthorpe United 2–3 Millwall". BBC Sport. 2017-05-07. Retrieved 2017-05-07. ^ "Match preview – Millwall vs Bristol City". Sky Sports. 6 April 2018. Retrieved 6 April 2018. ^ "EFL essential stats: In-form Millwall set club away wins record". Sky Sports. 6 May 2018. Retrieved 6 May 2018. ^ Lindsay & Tarrant (2010), p. 8. ^ a b Lindsay & Tarrant (2010), p. 36. ^ "125 Year Anniversary". Millwall Football Club. Archived from the original on 8 July 2010. Retrieved 28 August 2010. ^ "Millwall show support for the 100th anniversary of WW1". Millwall Football Club. Retrieved 16 October 2014. ^ a b "Millwall Badges". The Millwall History Files. Retrieved 28 August 2010. ^ "Zampa the Millwall lion steals Zampa Road sign!". Wake Up Millwall. 19 December 2008. ^ Lindsay (1991), p. 14. ^ "The Dockers 1885–1910". No One Liks Us Fanzine. 13 September 2010. Retrieved 13 September 2010. ^ Lindsay & Tarrant (2010), p. 19. ^ a b "Dockers' Day". Millwall Football Club. 20 February 2012. Archived from the original on 26 February 2014. Retrieved 13 September 2010. ^ a b "East Stand named". Millwall Football Club. Archived from the original on 24 January 2011. Retrieved 21 January 2011. ^ "Millwall announce new sponsors". millwallfc.co.uk. Retrieved 26 June 2013. ^ Ronay, Barney (27 January 2017). "How the battle to save Millwall's stadium was won". Retrieved 28 January 2017. ^ "Load of Bullocks". Private Eye. London: Pressdram Ltd. 10 February 2017. ^ "Nick Banks: We'll Score Again". This Is Exeter. Archived from the original on 21 April 2013. Retrieved 28 August 2010. ^ "FACT SHEET – East End Food & Drink". VisitEastLondon.co.uk. Archived from the original (Doc) on 26 October 2007. Retrieved 11 December 2008. ^ Ley, John (30 May 2010). "Millwall 1 Swindon 0". The Telegraph. Retrieved 28 August 2010. ^ "Shoeshine Boy, 30 September 2010 Podcast". Millwall Supporters Club. 30 May 2010. Archived from the original on 14 September 2010. Retrieved 28 August 2010. ^ "We Are Going Up!". Millwall Football Club. Archived from the original on 2 July 2010. Retrieved 28 August 2010. ^ "Football Rivalries census" (PDF). Football Fans Census. Archived from the original (PDF) on 20 October 2013. Retrieved 27 November 2007. ^ "2012 Football rivalry census results". Retrieved 6 September 2012. ^ a b "Millwall 0 West Ham 0". BBC Sport. 17 September 2011. Retrieved 17 September 2011. ^ Brown, Oliver (28 August 2009). "West Ham v Millwall: a history of how the rivalry started". The Telegraph. ^ Lindsay (1991), pp. 156–184. ^ Lindsay & Tarrant (2010), p. 501. ^ "West Ham and Millwall should never play again, says Harry Redknapp". The Telegraph. London. 27 August 2009. Retrieved 20 October 2010. ^ a b Bradshaw, Peter (2005-09-09). "Green Street". The Guardian. London. Retrieved 2013-12-18. ^ a b "The English disease: How Leeds and Millwall fans were the scourge of football, by Hillsborough coroner". Yorkshire Evening Post. 25 January 2016. Retrieved 20 September 2017. ^ "Why Are Leeds & Millwall so Hated?". Copa90. 27 January 2018. Retrieved 10 July 2018. ^ "Fans clash with police who kept Leeds United and Millwall hooligans apart". Yorkshire Evening Post. 27 October 2007. Retrieved 20 September 2017. ^ Jackson, Jamie (9 May 2009). "Police prepare for crowd trouble as Leeds and Millwall chase promotion". The Guardian. Retrieved 19 September 2017. ^ Lindsay & Tarrant (2010), p. 480. ^ a b "Charlton's Head to Head comparison with Millwall". Statto. Archived from the original on 28 September 2015. Retrieved 28 September 2015. ^ Lindsay & Tarrant (2010), p. 488. ^ "Millwall's Head to Head comparison with Crystal Palace". Statto. Archived from the original on 28 September 2015. Retrieved 28 September 2015. ^ Lindsay & Tarrant (2010), p. 489. ^ "Introducing the squad". Millwall F.C. Retrieved 11 May 2017. ^ "U23s – Millwall FC". Millwall Football Club. Retrieved 30 March 2019. ^ "The Boy Dunne Good". Millwall Supporters Club. Retrieved 28 August 2010. ^ "The Millwall Hall of Fame". Millwall Football Club. 20 September 2012. Archived from the original on 5 March 2015. Retrieved 16 November 2007. ^ "Internationally Capped Millwall players". EU Football. Retrieved 13 October 2010. ^ a b "The men who've shaped Millwall: 1880's". Vital Football. Retrieved 30 September 2010. ^ a b "The men who've shaped Millwall: 1890's". Vital Football. Retrieved 30 September 2010. ^ a b Lindsay & Tarrant (2010), p. 208–231. ^ Lindsay & Tarrant (2010), p. 208. ^ Lindsay & Tarrant (2010), p. 209. ^ Dell'Apa, Frank (6 April 2010). "Berylson going to wall". The Boston Globe. Retrieved 10 October 2010. ^ "Who's Who". Millwall Football Club. Archived from the original on 1 October 2012. Retrieved 6 October 2010. ^ "Millwall Holdings PLC". Millwall Holdings PLC. Archived from the original on 10 January 2010. Retrieved 28 August 2010. ^ "England: All Time Table". Statto.com. Archived from the original on 23 July 2011. Retrieved 28 July 2011. ^ a b c d e "Millwall Records". Statto. Archived from the original on 31 October 2010. Retrieved 28 August 2010. ^ Lindsay (1991), pp. 120–122. ^ "Millwall chairman John Berylson absolves pitch invaders after Wembley's £250,000 security failed to contain them". The Mirror. Retrieved 21 May 2017. ^ "No one likes us – but we don't care". The Journal, Newcastle. Retrieved 28 August 2010. ^ "Attendances". Millwall Football Club. Archived from the original on 30 September 2009. Retrieved 28 August 2010. ^ a b "Panorama". BBC's Panorama. Archived from the original on 22 June 2010. Retrieved 2 October 2010. ^ a b "Millwall Bushwackers Hooligans". Football Hooligans. Retrieved 28 August 2010. ^ a b c d e Nick Hart (1 October 2010). "The First 125 Years". South London Press. p. 46. ^ pr: Norma Spence (1989). No One Likes Us – We Don't Care. Working Pictures Ltd, for Channel 4 (VHS). ^ "Former Millwall striker Gavin Grant guilty of murder". BBC Sport. 23 July 2010. Retrieved 28 August 2010. ^ "Man is stabbed as West Ham and Millwall fans brawl outside stadium | Mail Online". Daily Mail. 26 August 2009. Retrieved 31 July 2010. ^ Dunning (1988), p. 68. ^ a b c d Davies, Christopher (21 May 2004). "Millwall hopes to leave dark history behind in F.A. Cup final". The Japan Times. Retrieved 26 March 2008. ^ Dunning (1988), p. 150. ^ "Millwall 1964–1966 Back to Back Promotions". The Millwall History Files. 30 September 2010. Retrieved 30 September 2010. ^ "FA lift penalties on Luton and Millwall; Successful appeal against riot decision". The Times. UK. 19 July 1985. ^ Armstrong, Gary; Giulianotti, Richard (June 2001). Fear and Loathing in World Football. Berg Publishers. p. 65. ISBN 1-85973-463-4. ^ "Four charged over Millwall violence". BBC Sport. 4 May 2002. Retrieved 25 August 2009. ^ "Met drops threat to sue Millwall". BBC Sport. 13 November 2002. Retrieved 25 August 2009. ^ "Leeds United v Millwall: Police mount anti-hooligan operation". Yorkshire Evening Post. Retrieved 28 August 2010. ^ "Millwall v Leeds United: Police issue behaviour warning". Yorkshire Evening Post. Retrieved 28 August 2010. ^ "Millwall ran out comfortable 2–0 victors over Charlton in the Championship". Sky Sports. 16 March 2013. Retrieved 30 July 2018. ^ Jon Culley (26 January 2009). "Hull to bill Millwall for damage to stand". The Independent. UK. Retrieved 25 August 2009. ^ "Mass violence mars London derby". BBC Sport. 25 August 2009. Retrieved 25 August 2009. ^ "FA to probe Upton Park violence". BBC Sport. 25 August 2009. Retrieved 26 August 2009. ^ "West Ham fined £115,000 over violence against Millwall". BBC Sport. 15 January 2010. Retrieved 19 July 2010. ^ Tobey Porter (1 October 2010). "This Crosses the Lion". South London Press. p. 84. ^ "The Book of Football – The Start of No One Likes Us". The Millwall History Files. Retrieved 25 August 2009. ^ The chant so famous as to be mentioned in a book review about football in Bangladesh: McKay, A. C. 2012. Scoring off the field: Football culture in Bengal, 1911–90, by Kausik Bandyopadhyay. Asian Ethnology 71.1:151–152. ^ Walker, Michael (5 April 2004). "FA Cup semi-final: Sunderland 0 – 1 Millwall | Football | The Guardian". The Guardian. Retrieved 25 August 2009. ^ "Scotsman.com Sport". The Scotsman. 13 January 2009. Retrieved 25 August 2009. ^ "FA Cup: Fans arrested after Millwall violence". BBC News. 14 April 2013. Retrieved 2013-04-14. ^ "Millwall 1–3 Leicester: Angry fan rips linesman's flag apart". BBC. Retrieved 4 January 2014. ^ "League One play-off final: Millwall fans 'storm security barriers' at Wembley". Evening Standard. 29 May 2016. Retrieved 30 May 2016. ^ "Millwall promise to hand life bans to any fans involved in violent clashes during League One play-off final defeat". The Independent. 29 May 2016. Retrieved 30 May 2016. ^ a b c "Millwall v Everton: Police say violence 'worst for some time'". BBC News. 28 January 2019. Retrieved 29 January 2019. ^ "Millwall Community Scheme – Linkedin". linkedin. Retrieved 27 July 2013. ^ "Millwall Community Scheme". MCS. Archived from the original on 24 July 2013. Retrieved 27 July 2013. ^ "Millwall's community work a far cry from the violence of the club's past". Goal.com. Retrieved 27 July 2013. ^ "Game played in honour of murdered teens Jimmy Mizen and Rob Knox". NewsShopper. Retrieved 6 September 2010. ^ "Millwall fans raise £10,000 for Help for Heroes". NewsShopper. 3 May 2011. Retrieved 27 July 2013. ^ "Green Street ending". Ruined Endings. 24 September 2010. Retrieved 24 September 2010. ^ a b "BBC Sport – Lawro's predictions". BBC Sport. 15 September 2011. Retrieved 20 February 2014. ^ "The Firm 1988". All Movie. 24 September 2010. Retrieved 24 September 2010. ^ "Arrivederci Millwall". iMDb.com. 17 July 2011. Retrieved 17 July 2011. ^ "Football Factory". Brit Films. 24 September 2010. Archived from the original on 8 November 2007. Retrieved 24 September 2010. ^ "Rise of the Foot Soldier". Films Review. 17 September 2010. Retrieved 17 September 2010. ^ Gysin, Christian (27 August 2009). "Rampage of the cyberthugs: How veteran hooligans used the internet to set up bloody battle". The Daily Mail. London. Retrieved 18 December 2013. ^ "Green Street Hooligans 2". The New York Times. New York. Retrieved 18 December 2013. ^ a b Graham, Jamie (17 August 2009). "The Firm : Film Review". Total Film. Retrieved 6 January 2014. ^ Catterall, Ali. "The Firm – Film4". Film4. Retrieved 6 January 2014. ^ Bradshaw, Peter (18 September 2009). "The Firm : Film Review". The Guardian. Retrieved 6 January 2014. ^ Rowley, Emma (31 October 2009). "Cast of Hooligan Film Among 'Wanted' Fans". Sky News. Retrieved 5 January 2014. ^ "Football 'wanted men' were actors". BBC News. 31 October 2009. Retrieved 5 January 2014. ^ "Harchester dreams at Millwal". The Official Harchester United Website. 2 October 2009. Retrieved 2 October 2010. ^ "No One Likes Us, We Don't Care: True Stories from Millwall, Britain's Most Notorious Football Holigans". John Blake. Retrieved 22 November 2013. ^ Calvin (2010), pp. 1–11. ^ Sullivan, Chris (1 February 2008). "How Daniel Day-Lewis' notoriously rigorous role preparation has yielded another Oscar contender". The Independent. Retrieved 4 July 2010. ^ Coles, Bill (7 November 2009). "David V Goliath". The Express. Retrieved 4 July 2010. ^ "Denzel Washington on being Millwall not Man Utd". BBC Radio 5 live. Retrieved 24 November 2010. ^ "Kick It Out defends Lord Ouseley comments on Millwall alleged racist chanting". Sky Sports. Retrieved 22 February 2019. ^ "I often get asked by folks in the UK/IRE if I follow an FC..." Twitpic (own work by Mr. Estevez). Retrieved 12 December 2011. ^ "In between teams". Soccer AM. Retrieved 14 September 2010. ^ "Graham's garter be joking..." Millwall FC. 17 November 2004. Archived from the original on 13 September 2012. Retrieved 26 September 2011. ^ Kimpton-Nye, Andy (22 May 2008). "Gregg Wallace Zoo Magazine". The Express. Archived from the original on 10 May 2015. Retrieved 4 July 2010. ^ "Millwall fan Danny Baker and West Ham United supporter Ray Winstone swap 'Shirts of Hurt' for Sport Relief". Goal. Retrieved 27 September 2010. ^ Power, Helen; Leroux, Marcus (1 January 2010). "Will Theo Paphitis come in with £1 to save La Senza, the lingerie firm he sold for £100m?". The Times. Retrieved 28 August 2010. ^ "All Wright!". Millwall Football Club. 12 August 2009. Archived from the original on 6 April 2012. Retrieved 4 July 2010. ^ Robinson, James (22 January 2010). "Rod Liddle defends quip about Auschwitz on Millwall fans' forum". The Guardian. Retrieved 27 September 2010. ^ "Tamer Hassan interview". Talk Sport. Archived from the original on 25 July 2011. Retrieved 27 September 2010. ^ Hyde, John (19 July 2008). "Millwall fans back 'home' on the Isle of Dogs". Docklands 24. Retrieved 19 July 2010. ^ "About Andy". Official Andy Fordham site. Archived from the original on 4 June 2011. Retrieved 27 September 2010. ^ "Bob Crow". The Socialist Worker. Retrieved 27 September 2010. ^ "On the Phone with Rancid's Lars Frederiksen". MLS Insider. 19 November 2009. Retrieved 17 September 2010. ^ Philip, Robert (29 March 2004). "Maloney's FA Cup vote goes firmly to Millwall". The Telegraph. Retrieved 27 September 2010. ^ "Get better united". Soccer AM. Retrieved 27 September 2010. ^ "A baptism of fire on three counts for Louie McCarthy-Scarsbrook". St Helen Star. 19 February 2011. Retrieved 19 February 2011. ^ "No one likes us. We don't care". Twitter. 28 March 2012. Retrieved 28 March 2012. ^ White, Jim (6 October 2008). "Morrissey plumps for Millwall game". The Telegraph. Retrieved 4 July 2010. ^ Alexander, Harriet (17 April 2011). "Timo Soini: The Finnish bear mauling the EU's bailout plans". The Telegraph. Retrieved 17 April 2011. ^ Barrymore, Michael (30 October 2015). "Michael Barrymore". twitter.com. Retrieved 28 January 2017. ^ "Stabbed Millwall fan recounts fight with London Bridge attackers". The Guardian. Retrieved 7 June 2017. Calvin, Michael (2010). Family: Life, Death and Football. Integr8 Books. ISBN 0-9566981-0-7. Dunning, Eric (1988). The Roots of Football Hooliganism: An Historical and Sociological Study. Routledge. ISBN 0-415-03677-1. Lindsay, Richard (1991). Millwall: A Complete Record, 1885–1991. Breedon Books Publishing Co Ltd. ISBN 0-907969-94-1. Lindsay, Richard; Tarrant, Eddie (2010). Millwall: The Complete Record. DB Publishing. ISBN 1-85983-833-2. Bethell, Chris; Millwall FC Museum; David Sullivan (1999). Millwall Football Club 1885–1939. Tempus. ISBN 0-7524-1849-1. Murray, Jim (1988). Lions of the South. Leatherbound Island. ISBN 1-871220-00-9. Robson, Garry (2000). No One Likes Us, We Don't Care: The Myth and Reality of Millwall Fandom. Berg Publishers. ISBN 1-85973-372-7. Spaaij, Ramón (2006). Understanding Football Hooliganism: A Comparison of Six Western European Football Clubs. Vossiuspers UvA. ISBN 978-90-5629-445-8.